Refrigerants are the blood of a vapor compression system. They are pumped round and round in an infinite loop of compression and expansion. The types of materials selected for use in refrigeration are based on a number of factors, the most important of which is the application and temperature range desired. For this reason, there is no specific refrigerant which is best for all cases. Some desirable characteristics of a refrigerant are a high heat of vaporization, low specific volume of vapor, chemical stability, low condensing pressures, boiling point at atmospheric pressure well below desired evaporator temperatures and of course, availability and low toxicity. The last point is not stressed nearly often enough. Most modern refrigerants are manufactured by Dupont or other chemical companies. These substances, although effective as refrigerants and when applied appropriately they work very well, are often toxic, destroy the atmosphere, contain substances of which the manufacturing is quite polluting, and finally are expensive and proprietary. The machines they are designed for are themselves designed for the refrigerant and so are dependent on the chemical company’s product. This becomes especially concerning with azeotropic refrigerant blends. These are mixtures of different refrigerants in specific ratios that produce varying properties over the range of operating pressures and temperatures. Operating in a sealed system, I’m sure they work quite well if suited for the application, the problem comes when a leak occurs in a vapor compression system. The refrigerant blend will not all leak out in the same ratio it was installed instead, the lightest, most volatile components will leak first changing the makup of the blend and thus changing it’s properties. If the machine begins to work improperly, little can be done but to recover the remaining mixture and replace it with all new. Hopefully the recovered mix will be reprocessed and restored to a useful working fluid, but that requires resources that service techs and industry may not always want to spend. The point is, industry produced refrigerants tend to toxic, nasty substances which lead to a dependency on corporations and should be avoided for their lack of sustainability. Other refrigerants that were used in the past and have been largely phased out are Methyl Formate, Methyl Chloride and Sulphur Dioxide. These were mostly dangerous, ozone depleting and/or corrosive to certain system components. Carbon Dioxide is gaining use in some industries however, it’s high condensing pressures make it unsuitable for small domestic use. Anhydrous Ammonia was probably one of the first refrigerants and is still very common today. Large ice producing plants utilized ammonia’s high heat of vaporization and low boiling point to kickstart the refrigeration industry. Ammonia is still used in large food processing plants, ice skating rinks and a ton of other industries. It was even used in some early domestic refrigerators however, it’s noxious nature and suffocating nature make it somewhat dangerous to have in small, poorly ventilated areas. Water is probably the only refrigerant with better heat of vaporization than ammonia. The problem with water for most refrigeration needs is it’s high boiling point at atmospheric pressure requiring vacuums to be formed, it freezes at or near 0 degrees Celsius and a very high specific volume of vapor making it difficult to handle as a gas. It is used in some large industry applications utilizing incredibly heavy built turbine compressors. This brings me to hydrocarbon refrigerants. These are hydrogen carbon chains which are refined from fossil fuels and usually known as a fuel gas. The most common are propane, butane. These have properties similar to industry refrigerants like R-22, R-12 and R-134A. In some cases, hydrocarbon refrigerants are use to replace the phased out R-12, commonly known as Freon in some antique automobiles. Hydrocarbon refrigerants have been used for decades going back at least to the 1920’s and probably further. Somewhat recently, they have seen a surge of use in Australia, Japan and Europe. As I understand It, Germany has made a successful transition to all hydrocarbon refrigerant domestic refrigerators. These substances have good thermal properties, they’re non-corrosive, are compatible with all oils, quickly breakdown into non-hazardous byproducts if vented into the atmosphere, are cheap and pretty widely available. A drawback pointed out in the land of corporate protectionism is their potential flammability. This is of little concern if handled responsibly. The amounts of refrigerant required to operate a domestic refrigerator or air conditioner amounts to ounces and the air/fuel ratio and severity of leak to get ignition would be very rare. Besides, all refrigerants carry oil vapor with them and are flammable in specific concentrations. The dangers of hydrocarbons are similar to any other refrigerant really. Asphyxiation, frost bite and dangers associated with pressurized gases are more concerning and these can be avoided with common sense and responsible handling. I have myself experimented with common BBQ tank grade propane in a heat pump application and found it to be quite promising. 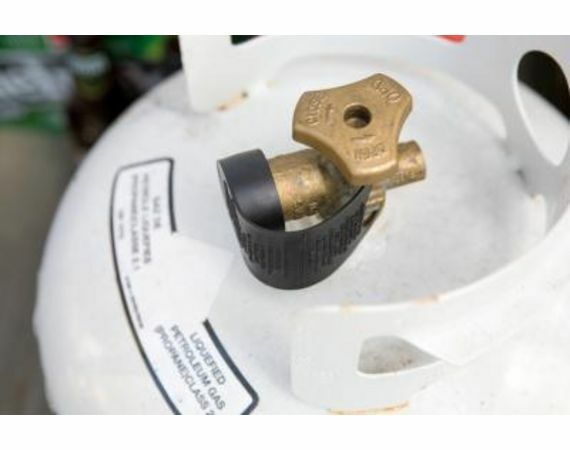 Fuel type propane quality standards are not tightly controlled and so the as a refrigerant, properties can vary quite a bit however, refrigerant grade propane and butane are available. R-290 and R-600 respectively. These will be my refrigerant of choice until I find something better. R290 / Propane is an excellent refrigerant selection, you will be hard pressed to find something better for your application. Propane was used in early commercial systems, as was NH3, but R-12 was so good, cheap, non toxic, and non flammable that it wiped out most everything else. It is a real shame that it damages the ozone layer and was phased out. The cylinders that you are using though cannot be counted on for anything resembling refrigerant grade propane. There are postings around the internet where people have used low purity propane (which often is mostly butane) and the refrigeration results are messing them up. The mixture of gas / liquid properties causes system instability. Consider to actually buy some real, 99% or better propane from a welding supply store. If they don’t have it, they can order it in. Yeah, the high purity stuff is especially expensive. I priced a 20 pound cylinder at about $220 American. If I remember correctly, the BBQ grade (HD-5) propane is at least 90% propane, no more than 5% propylene (a good refrigerant itself, but higher vapor pressure), and some other gases, including butane, isobutane, methane, and ethane. It is true that HD-5 will not produce the most consistent results, but it is cheap, and it has been known to work in some heat pumps and small appliances for years without trouble (with some considerations for filter / driers). One of these days, I’d like to try my hand at purifying some HD-5 to remove the water, butane, and the “non-condensables” like methane and ethane. Until then, this stuff is cheap, and it works great!